Lara Call Gastinger is a botanical artist and illustrator from Charlottesville, VA. Gastinger is the lead illustrator for the Flora of Virginia project. 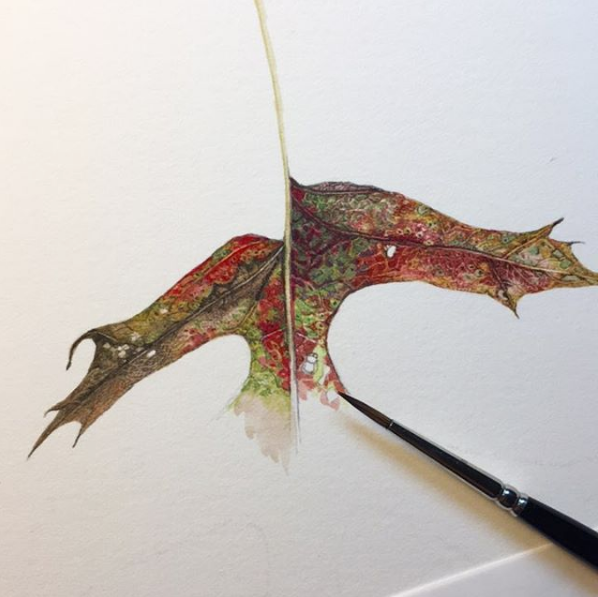 She has over 50,000 followers on Instagram where she posts samples from her own nature journal. Gastinger’s art focuses on the minute details of nature and the processes of change and decay in the natural world. Gastinger teaches spring and fall classes in botanical illustration classes at Lewis Ginter each year. We sat down with Gastinger to discuss her upcoming Botany and Journaling class and her artwork. Q: What sparked your interest in plants and botanical illustration? A: When I was a teenager, our family would go on National Wildlife Federation Family Nature Summits, which are basically like summer camp for families. 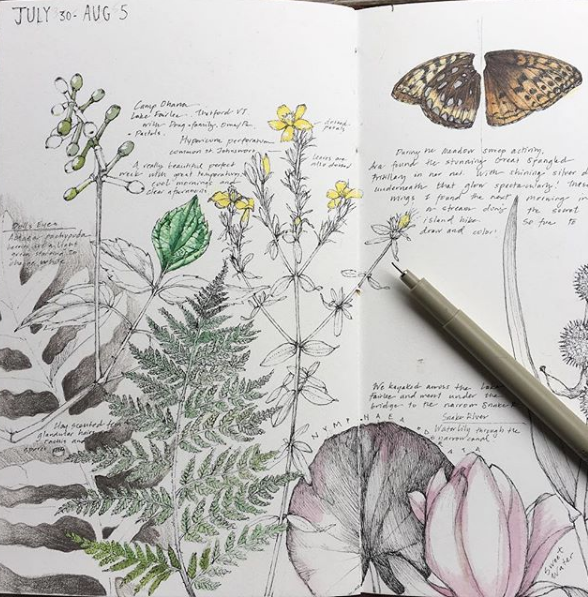 Part of the summit was learning about the plants in the parks and at one of these summits, I happened to meet a woman who taught me how to draw in a nature journal. I was very inspired by the fact that you could draw plants for identification purposes. So, from an early age, I knew I wanted to combine science and art together as a career. I went to the University of Virginia and got my undergraduate degree in Biology and also Architecture so I thought I’ll be a landscape architect. Then I went back to school at Virginia Tech and got my Master’s degree in Plant Ecology so I thought I’ll be a field botanist. Q: How did your goal of becoming a field botanist change into a career of botanical art? 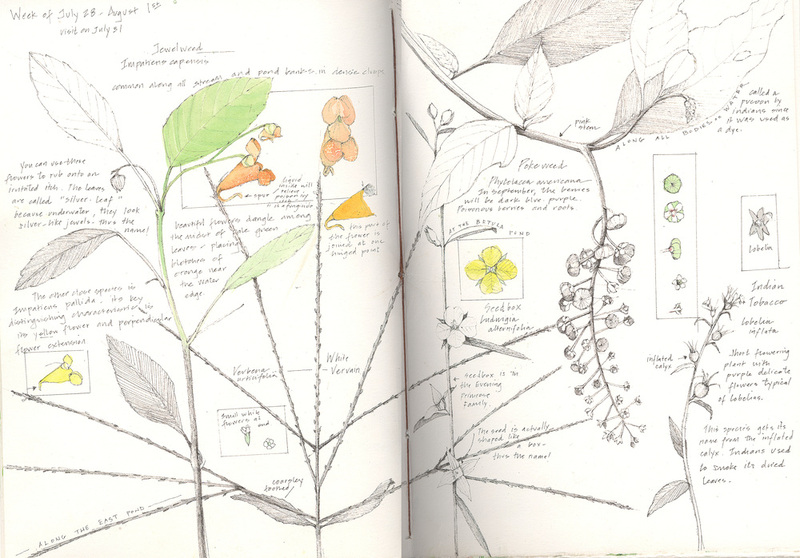 A: In 2000, I started a nature journal because I loved drawing plants as I was learning them. I started doing some commissions for botanical watercolors, but I really didn’t consider myself a botanical artist until I started working on the Flora of Virginia Project in 2001. Have you heard of it? It’s a botanical reference guide to Virginia’s natural flora. They needed a botanical illustrator so, over the course of 10 years, I collected and illustrated over 1,300 native plants. In 2012 it was finally published. The release party was actually at Lewis Ginter. Now I consider myself a botanical artist and it’s the perfect union of science and art. Gastinger uses both her artistic skills and science background in many of her illustrations, like this highly technical commissioned work. Q: On your Instagram (@laragastinger), you posted about starting a perpetual journal. Can you explain the difference between a nature journal and a perpetual journal? A: A perpetual journal is a journal that you date the pages to represent, let’s say, a week out of the year and you return to those same pages every year. A page from Gastinger’s perpetual journal. So, one page of your journal might have notes and illustrations from multiple years or multiple entries from the same year. It’s a great way to document change across different years. Every year you get to go back to the first week of February, for example, and go,”Oh look, the maples were blooming.” It’s great if you’re trying to learn the plants around you and when they bloom. You can definitely say it’s a very mindful practice. I take my journal with me pretty much everywhere and use it when I’m traveling to take a break from other people or my kids. For a New Year’s Resolution, I explained to my Instagram followers how to start their own perpetual journals this year using the hashtag, #lgperpetualjournal. The response has been overwhelming. It’s amazing that people all over the world are doing it. It makes me so proud! Gastinger does much of her work in pen but also enjoys watercolor illustrations. Q: Can you still keep a perpetual journal if you’re not artistic? A: For people who can’t draw, it still works because you can still write and document and take pictures. We’re not creating botanical masterpieces, we’re creating a way to document and be in the tune with the world around you. Q: This spring you’re teaching a class on Botany and Journaling at Lewis Ginter Botanical Garden. What can students expect from taking the class? A: We meet three times over the course of the class — mid-March, mid-April, and mid-May. What’s amazing is how much changes in a month dramatically. The spring class is great because you get to see spring arrive. The fall class is cool because you get to see the frost coming in. Besides learning the journal skills, the classes give students a chance to be outside and learn a little bit of plant identification. 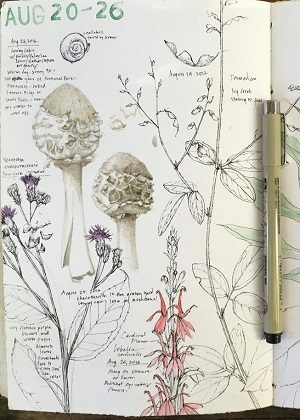 I teach how to put together a sketchbook, show them some examples and we go over the different mediums to use whether its pencil, pen or watercolor. And then there’s this wonderful aspect of community — being together with the other students outside. A page from Gastinger’s journal with a Pigma Micron pen, one of her favorite drawing tools. A lot of the students are in the Botanical Illustration Certificate Program and are used to taking a long time to do a painting. This class helps them become a little looser. Some of them are perfectionists and want to sit down and create elaborate paintings. I’m trying to encourage more forgiveness — you can make mistakes, add and subtract things. It’s very in the moment. Q: Where is your favorite place to draw in your journal? A: My favorite place to journal is Big Meadows in the Shenandoah National Park. It’s a high elevation open meadow and it changes so much every season with the colors, textures and plant communities. Q: And, finally, what plants do you like illustrating most? A: Winter specimens are my favorites to draw, especially the ones with really elegant structures with the roots or the curling dried leaves. I definitely gravitate towards the not-so-pretty parts of plants. Some people call it wabi-sabi, or the perfection of imperfection. I’m not much of a flower person, I prefer the structural elements. 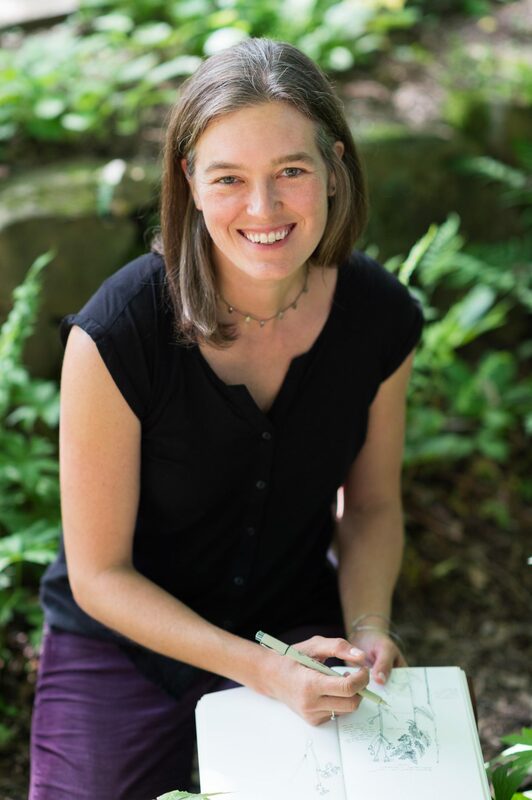 Register or learn more about for Botany and Journaling with Lara Call Gastinger. Maureen McNabb is a Public Relations & Marketing Intern at Lewis Ginter Botanical Garden with a background in journalism, videography and multimedia storytelling. She's interested in community building, empowering individuals and finding compelling stories that tend to get lost within the bigger picture. Join botanical artist Lara Call Gastinger to learn how to use a sketchbook to observe the ways plants change each month. Courses are designed to provide a thorough foundation in the classical approaches and disciplines of botanical illustration. Visit Gallery II in the Kelly Education Center, January 20 – March 31, 2018, to see work by students, instructors, and graduates of the Garden’s Botanical Illustration Certificate program.